Starting a pressure washing business is approachable and lucrative. You’ll be ready to start after taking some advice from other industry experts and following these six steps. You’ve finally decided to turn your love for pressure washing satisfaction into a profitable business. Great decision. You can make some serious bank if you start a power or pressure washing business on your own. But it takes some planning and preparation. Here are the first six steps you need to know when you’re starting out. After you master them you’ll be on your way to working with clients, hiring employees, and growing your business. Strategize your business: service offerings and scope. Get your power or pressure washing equipment: get a van and start off small. Create your brand: company name, logo, and contact information. Do marketing on social: join groups and post fun before an after content on Instagram, Facebook, and Twitter. Register and insure your business: establish as an LLC. Plan ahead for growth: think about how clients will keep in touch and book appointments, and how you will offer more services going forward. 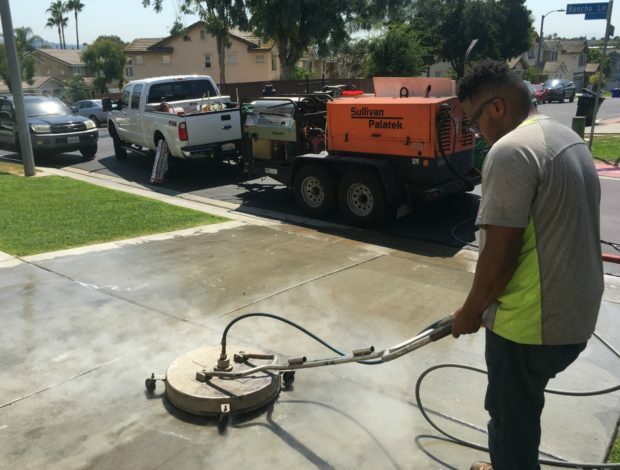 Power and pressure washing seems pretty straightforward, but if you’ve done your research into the industry and the direction it’s going in, you’ll see that there are a few things you need to iron out before hitting the streets. If you’re a power washing beginner then you should look into learning about this service before offering it to clients. You could seriously damage someone’s property if you use your equipment incorrectly. Check out this great resource to learn the power and pressure washing basics. Want to get some free advertising around town? The very first thing you need to do is decide on what your core service offerings are and who you’ll be servicing (i.e. residential, commercial, or industrial). Be focused. Don’t take on too much too quickly. Some projects might be bigger and more intense than what you and your equipment can handle. Limiting your service offerings will help you master them. Doing this will also help you narrow down your equipment from the start and reduce up front costs. The second thing you’ll have to iron out is your service offering scope. Some service providers focus on specific jobs, such as restoration, paint removal, general maintenance, windows, roofs and gutters, concrete, interlock, and more. Some service providers also offer window washing and other home cleaning services. You don’t have to do it all, you just have to do what you’re good at and focus on it. Once you’re a pro you’ll be able to take on bigger clients and bigger contracts. For example, it took Kris Cook, Owner of KC Power Clean, thirteen years to grow his business into the fully-fledged power washing company that it is today. By then, he was approached by Starbucks to do some paint removal work. This, in turn, led to an opportunity to provide the accompanying sandblasting service. This pivot helped him grow his business after buying the appropriate equipment and employee hands to help him do that. Your equipment needs will vary based on your service offering and scope. For example, if you’re just focused on pressure washing for residential clients, then you’ll need a pressure washer with a force of 3,500 PSI and above, hoses, first and second story reach nozzles, and a downstream valve. If you’re going to be doing commercial work, then you’ll need stronger equipment with more functionalities and your own water reservoir. As far as equipment goes, we’re in an industry that isn’t super technologically advanced, but there are some pieces of equipment out there, like the water-fed pole, or pure water cleaning in general, that are faster and safer. The right equipment will help you get certain jobs done, so think critically about the jobs you need to get done in your service offering. “This equipment allows you to work faster which helps you make more money,” Jersey explains. If you’re just starting off with a small pressure washing rig and a few other pieces of equipment, then you’ll need a truck or a van to get around to your job sites. 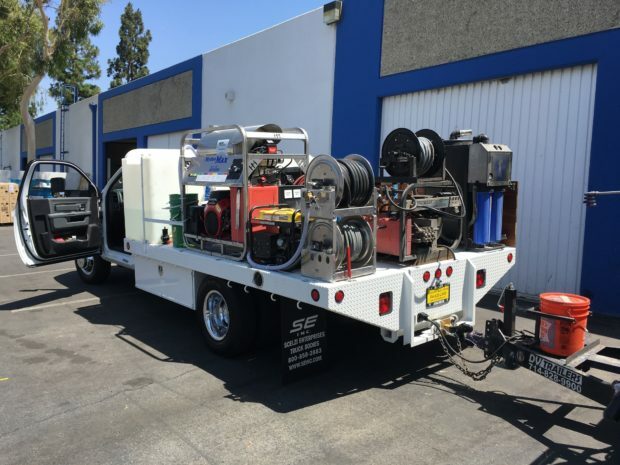 Once you start growing your business and taking on more equipment (like multiple self-contained heavy duty pressure washers and storage tanks), you’ll need a tough truck and a trailer to haul it all. You need a business name and logo if you’re ready to start taking on jobs. You’ll also need these things to register your business. Put your name and phone on your company vehicles (using decals), uniforms, quotes, emails, invoices, and marketing and advertising materials. You can’t run a business without an email, phone number, and website. Even if you’re running a small operation it’s a good idea to have a separate business phone number and email. This is especially helpful once your business starts growing. It’s easier to keep track of your clients if they are separate from your personal life. Consider using your company name to brand your email address. You can get a branded email for roughly $45 a year. If you’re strapped for cash then you can create a professional looking free email address using a Gmail account. Don’t be afraid to use your company name in your email address. We recommend you avoid using an email server that looks unprofessional (such as Hotmail, or Yahoo). Once you have your contact information, make it public on your website and Google MyBusiness account. Your website and Google MyBusiness are great for growing your pressure washing business through organic search traffic and work request forms. Setting up a social media account is one of the most important things to do when starting a pressure washing business. It can be very overwhelming though: you need to post regularly, at the right times, and engage with your community to get good liftoff. We recommend getting on at least one social network. If you can mange two, even better. But there are so many social networks. Which one should you use? This depends on three things: your preference, the content you want to share, and what networks your customers are on. If you choose a network based on these three things, then you’ll quickly see that social media marketing isn’t a huge commitment because it will be fun to use, and you’ll be able to connect with leads that will help you grow your business. It’s also free! A social media presence is essential because it helps your business be seen and get into your local community through groups, hashtags, and locations. The number of followers that you have isn’t necessarily as important as how (and how often) you interact with your audience. However, you’ll have to start off by growing your social media audience to connect with locals. Profiles on social media networks will include different information sections. For example, a Facebook Business page will include an entire “about” page, whereas Instagram will give you only 150 characters to tell people about your account. The most important things to include in any social profile are your business name, business information, website link, and contact in the account profile. You can also include a work request link right on your profile in the link in your bio, or directly in your profile on some social networks, such as Facebook. Use these social networks to post content about your services and other helpful power washing information. You’ve got to get ready for the digital age and social media. The type of content you post on social is entirely up to you. The most effective social media content is typically more helpful than it is promotional. Professional social media marketers go by the 80/20 rule. This means that only 20 percent of your content should be promotional (i.e. deals, promotions, and services offered), and the other 80 percent should be other types of content (i.e. when you should hire a professional, home care maintenance best practices, or those satisfying power washing videos everyone loves). For example, Greg Brooks, CEO of Gleam Pressure Washing is thinking ahead of the game for his social media content. His tech purchasing decisions for 2019 are all about social media. You can post your content on any channel you’d like. It doesn’t have to be perfect. It just has to be there and be helpful. Power and pressure washing business owners have quite a bit of liability on their hands. Your equipment can cause a lot of damage if used incorrectly or if you make a mistake. It’s wise to invest in liability insurance to help protect and separate you from your businesses liability. You should also register your business with your local government. Do some research and figure out what steps you need to take to register your business. Establishing your business as an LLC will go a long way in separating your personal assets from your business assets. Depending on where you live, you may need to pay a bond, get a business permit, register your business for sales tax, and get an environmental permit. Here’s a helpful resource to help you register your power washing business. Start thinking about your business long term right now. How you can start growing in six months, twelve months, and two years from now? This might seem like you’re jumping the gun, but you’re not. If you have any desire to grow your business in any capacity, then you need to start thinking the next step ahead. If you want to start offering more services, such as window washing or sand blasting, then you’ll need some employee support to use the equipment and complete jobs fast enough to move on to the next contract. Take a look at Kris Cook’s business model as an example. He has a threefold market address: Contractors (to support sandblasting requirements on bigger jobs), Property Management companies (who provide regular maintenance income), and residential cleaning jobs. He didn’t get there without thinking about new opportunities and jumping on them when the opportunity arose. Now that your business is set up and running, we want to leave you with four tips to help iron out your process. You absolutely need to start thinking one step ahead if you’re going to run a killer pressure washing business. How are your clients going to book future services? Do you have any processes in place to encourage referrals? How will you grow? Make appointment bookings easy. After your client pays an invoice, send them a thank-you email along with an opportunity to schedule the next job. Automate your client emails. Create some email templates that you can send to your clients when you give them quotes, invoices, and accept payments so you can stay in touch every step of the way. Improve client retention with special offers. Offer discounted rates for follow-up appointments. Offer referral discounts. Give clients who refer you to their friends and family free services or discounts so they can network for you. Always think about how your business must evolve in six months, one year, and two years to reach these goals. But that’s enough planning. It’s time to get to work! Start hustling. Your business isn’t going to grow itself. Your search engine optimization (SEO) efforts should follow the Pareto principle. Learn how to do that here.